Word-of-mouth is a powerful tool. While a lot of word-of-mouth happens organically in conversation, social media offers an additional avenue for people to spread the word about your organization. But how do you get your enthusiastic members and supporters to promote you online? You have to ask them! And, better yet, show them how. Here are a few ways that your followers and dedicated fans can promote your organization using social media. Keep in mind that finding the word-of-mouth tool that works best for your organization will depend largely on what type of group you are, where you are most likely to find potential members, and what aspects of your organization you wish to promote. If you have a Facebook Page, this one is for you! 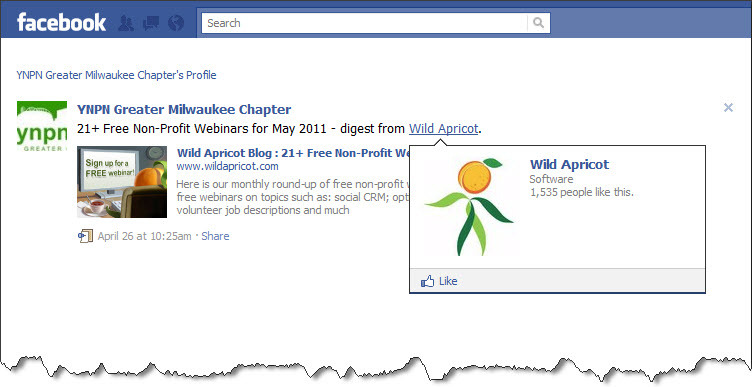 All non-profits, associations, clubs, businesses, and other organizations can benefit from Facebook word-of-mouth if their members and potential supporters have Facebook accounts. Facebook has the option for you to tag friends or pages when you post a status -- similar to a mention in Twitter. When users see your post, there will be a link to whoever you tagged. 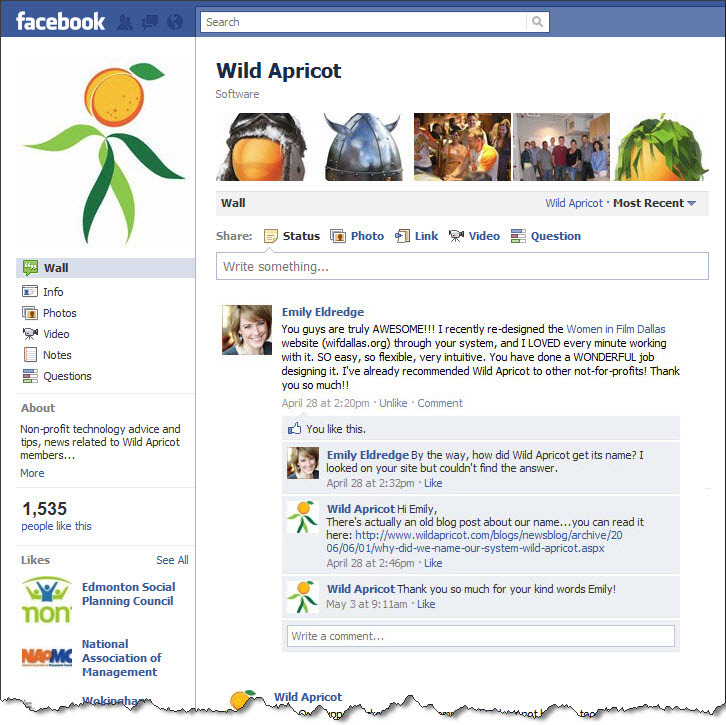 In this example, the Youth Nonprofit Network of Milwaukee tagged Wild Apricot in one of their posts. This type of update is generated from the personal profile of the person doing the tagging. If your volunteers are getting ready for a big event, you can ask them to tag your organization in their status if they're posting about it on Facebook. Tell your board members to tag you if you're doing a membership drive. The more you ask, the more likely you can reach your members' social networks. In order to be tagged, the person tagging you must either be your friend (if you have a personal profile), or Like you (if your organization has a page). When the person doing the tagging starts typing your name preceded by the @ symbol, Facebook will automatically start matching up to their friends and/or pages, and after they click on the appropriate profile to tag, Facebook will auto-generate a link to that profile. Read about tagging on Facebook Help. When you tag another Facebook user in a status or other wall post, not only does your message show up on your wall, but it shows up on the other user's wall as well. So, not only are the people who are already following your page getting to see what others are saying about you, the people who are "Facebook friends" with the person doing the tagging will see it as well. ...but it shows up on Wild Apricot's wall too! 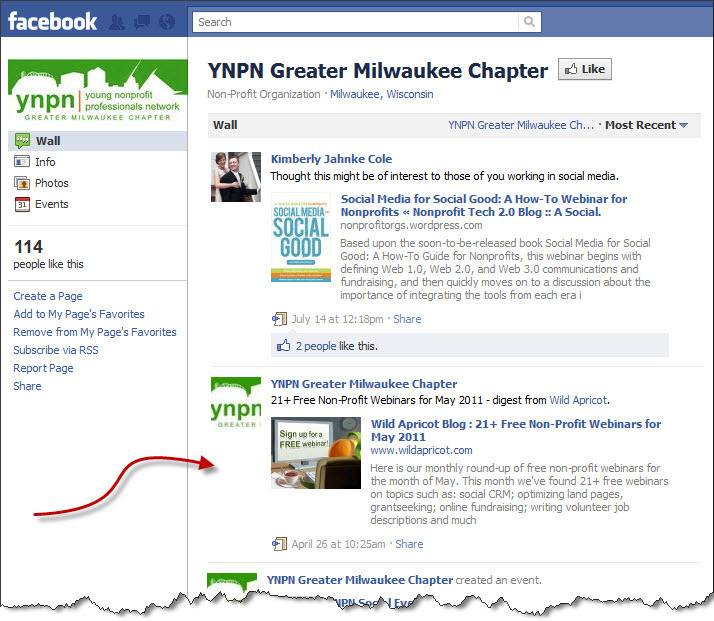 Ultimately, by having other people's posts show up on your wall, it shows anyone checking out your organization on Facebook that you have engaged members who care about the success of your organization -- and by having those people post on their own wall, you're potentially reaching a large network of non-members who might be interested in what you do! This is another Facebook feature that benefits anyone with a Facebook Page and members who have Facebook accounts. 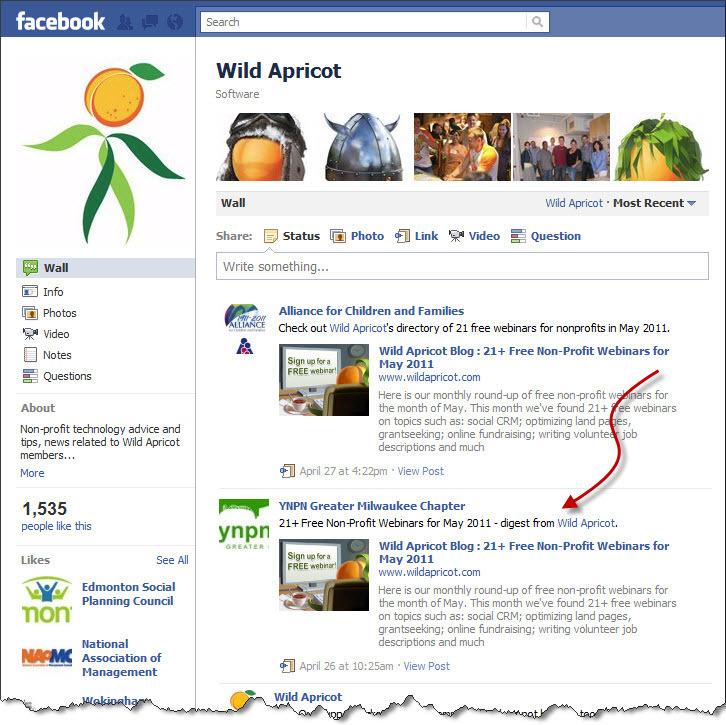 When your members visit your page, they can post on your page's wall in the same way they can post on their own walls, or leave comments on their friends' profiles. Read about page comments on Facebook Help. Asking your members to participate in a discussion on your wall helps your organization look active. 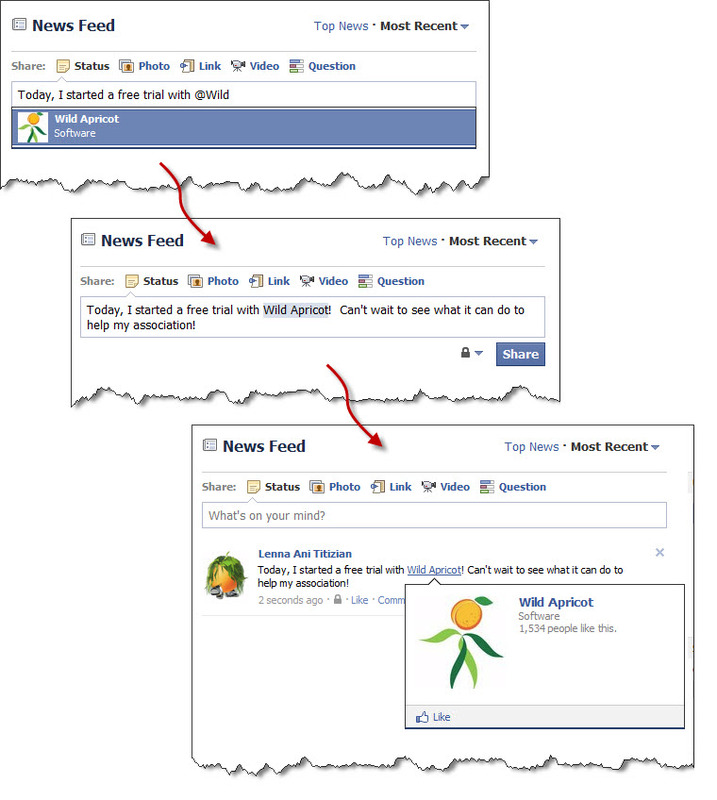 If Facebook users who are looking at your organization's page for the first time only see things that you've posted, with no comments from your members, it might be harder for them to connect to what you do. If they see posts from members talking about how much fun they had at your fundraising event, how excited they are to be joining your outreach committee, or how useful your networking luncheon was, that personal touch is just what your social network page needs. Unlike your main website, your Facebook page is a place to show off member engagement, and not just provide information. It is a social network, after all! This is useful if your organization has a Company Page on LinkedIn, and you have a particular service or program that your organization offers on an ongoing basis. Adding a product or service to a LinkedIn Company Page allows you to collect recommendations for that product or service from other LinkedIn users. The service listing needs to be added to your page by someone who has admin rights for your organization's Company Page. 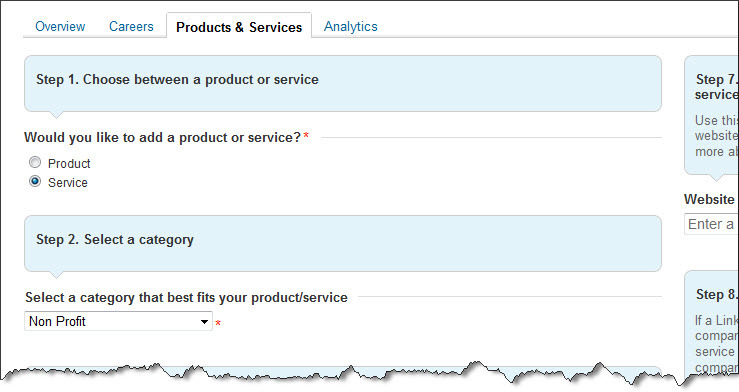 Click the "Products & Services" tab, and enter all the specifics of the program. 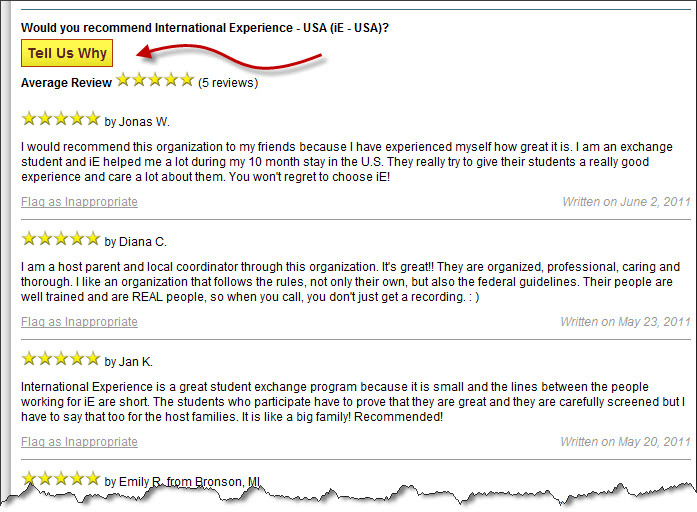 Once your service is added, users can leave recommendations. Since Wild Apricot offers a product that performs a service, we listed our product on LinkedIn so our clients who are users could comment on how our software-as-a-service has helped them manage their organization's membership. This is useful to gain recognition for some of the dedicated services your organization might offer, such as outreach programs, workshop series, training services, or other programs. The added benefit of having these reviews on LinkedIn is that anyone reading them can instantly see if they are connected in some way to the users who have posted the reviews. Knowing that someone who is a member of the same non-profit networking group or a similar sector is recommending a particular program is worthwhile as word-of-mouth and adds an air of trustworthiness to it. This underused feature on LinkedIn could help you promote your services, especially for business/trade associations or professional associations. There are also other sources of third-party Internet reviews. 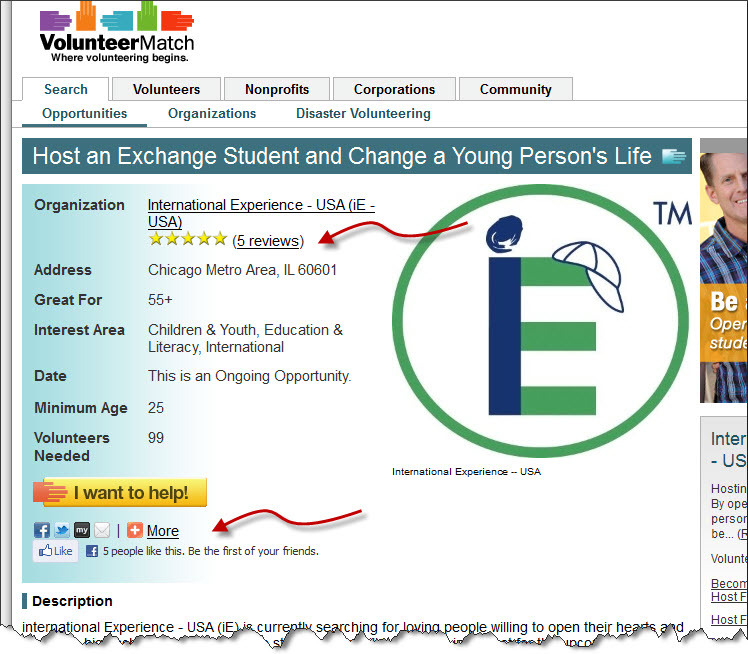 For example, if your organization wants to publicize your volunteer positions, there may be a number of sites you might find...like Volunteer Match. 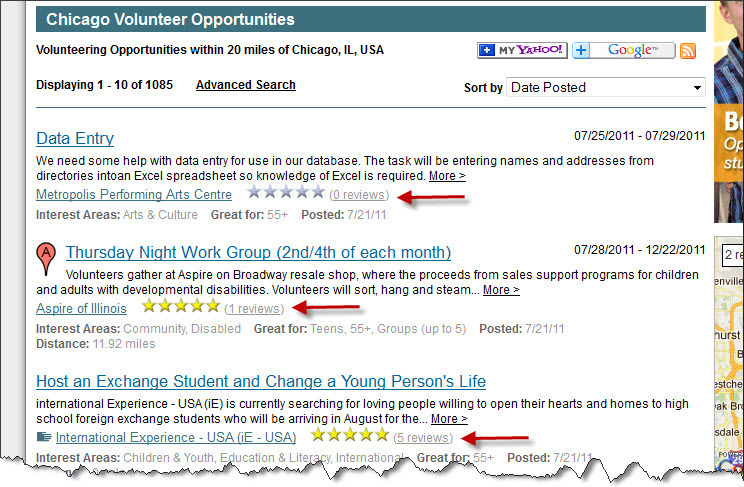 Volunteer Match provides a rating and review system for the various volunteer positions posted that is not unlike the reviews that you would read on Amazon for a particular product before you purchase it. Each system will work differently. In Volunteer Match, when you click the "Reviews" button, the system asks if you would recommend the opportunity with a large "Tell Us Why" button. Once users either create a volunteer account, or sign-in using Facebook, they are able to leave reviews of your volunteer position and rate their experience. Encouraging your volunteers to share open opportunity postings and review their experiences can help spread the word to other like-minded individuals, and help convince people that find your listings that the volunteer opportunity is a good one! There are a variety of ways your members can help spread the word about your organization online. And while word-of-mouth is a great recruiting tool, many organizations have a hard time harnessing their members' WOM goodwill. The best way to increase your word of mouth is to simply ASK -- ask for a particular action, ask many, and ask often! Very timely and great article... THANKS!! @Nicole - Thank you for providing us with a great example to use!